Lake View in Lineholt, near Stourport-on-Severn, Worcerstershire sleeps 4 people. Lake View near Stourport-on-Severn is situated in the heart of rural Worcestershire, in the River Severn valley; this is this wonderful, single-storey barn conversion which has been thoughtfully renovated with your comfort in mind. Boasting an open plan living space with exposed beams, this two bedroom property is ideal for couples, families and friends looking to relax or to explore the wonderful countryside. Lake View is nestled in a small cluster of barn conversions in a quiet and peaceful area. The enclosed garden overlooks the lake and rolling countryside, and enjoys a hot tub, so you can relax under the stars after a busy day. There are many footpaths leading from the property, which are perfect to explore either on foot or by bike. For family fun, Little Owl Farm Park is just over a mile away, where you can pet the animals, or for larger animals, West Midlands Safari Park is just 8½ miles away. The Georgian riverside town of Bewdley is close by, as is Kidderminster, the starting point of the world famous Severn Valley Heritage Railway. In the small busy village of Ombersley, you can find an award-winning delicatessen, fine dining restaurant and renowned pubs. The cathedral city of Worcester is within 10 miles, and you are in easy reach of the Malvern Hills, which are a must for walkers, as is the quintessential Cotswold’s, which has many beautiful villages to explore. Shop and restaurant 2 miles, pub 2½ miles. Living area: With 50 Smart TV with Netflix, iPod dock and French doors leading to garden. Bedroom 1: With super king-size bed, Freeview TV, beams and en-suite with shower cubicle and toilet. Ground source underfloor central heating, electricity, bed linen, towels and Wi-Fi included. Travel cot and highchair available on request. Welcome pack. External utility room with washing machine. Enclosed lawned garden with patio, garden furniture and barbecue. Enclosed astroturf courtyard. Hot tub for 4 (private). Bike store. Private parking for 2 cars. No smoking. Please note: There is an unfenced pond in the grounds, 20 yards away. Holidays at Lake View run from Friday to Friday. Pets allowed at Lake View. For a better idea of where Lake View is, you can see Lake View on the map below. Lake View is in Worcestershire; should you be on the lookout for a special offer, you can find all the special offers in Worcestershire. It's always worth checking to see what is on offer at the moment. 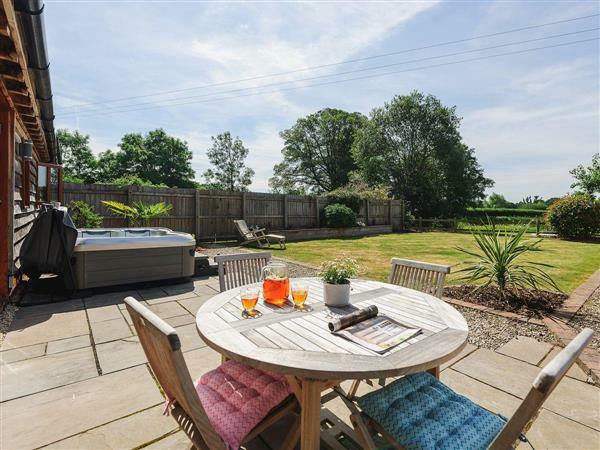 Do you want to holiday near Lake View (UKC2175), you can see other cottages within 25 miles of Lake View; have a look to find your perfect holiday location.